I love people, traveling with my husband and spending time with my family and friends. When at home, I love to decorate, tinker with my art quilts and talk on the phone with my sister. 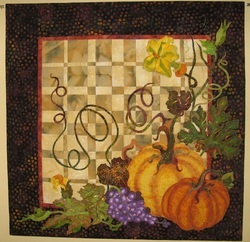 I keep busy teaching classes in art quilting and doing presentations and workshops for guilds in my area. and retired in 2002. I enjoyed teaching and missed the social conections of work so I combined my love of art and quilting and began teaching classes in art quilting. 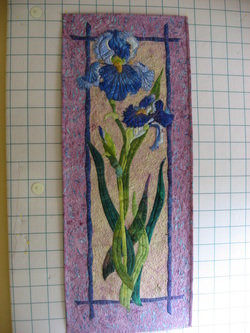 Classes I offer teach fabric art and design techniques that allow students of all levels to unlock the inner artist in themselves and create their own, unique fiber art masterpieces. 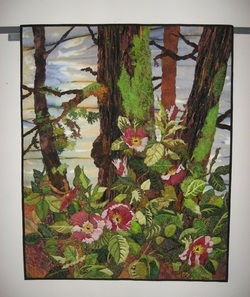 In these classes you will learn, using my fusing technique, to construct the flowers and leaves and techniques for shading and thread painting that will make your flowers "come alive". I will help you organize your composition and make fabric choices for your background. I can also offer suggestions for quilting. 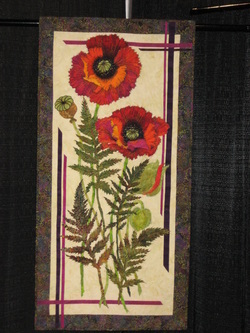 The Poppy, the Jaunty Geranium, the Elegant Iris, the Sizzling Summer Sunflower and Fall Festival are my entry level classes for qulters who are very familiar with their sewing machines and would like to explore art quilting as an extension of their quilting skills. No prior experience or artistic aptitude is necessary. 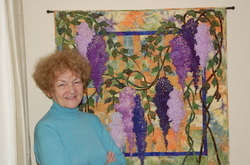 I teach classes regularily at Morning Star Quilt Shop in Paradise, Calif. and at Honey Run Quilt Shop In Chico, Calif. I will travel to teach classes or give presentations to most places in northern California. 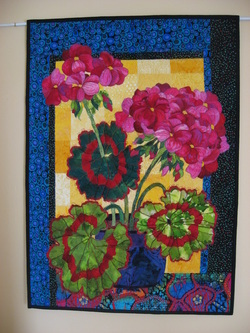 The geraniums class is another example of the beginning fusing and thread play technique that I teach. In this class you will construct the flowers and leaves separately then make it your own unique art piece through the composition and background. The iris class is inspired by the spring profusion of blooms in all the wonderful colors in nature. this class teaches my fusing and thread painting techniques along with pattern making using your own photographs. To celebrate the hot colors of summer, this class celebrates the sunflower. A different technique is used to achieve the styleized center and petals of the flower. Students are encouraged to create their flowers and backgrounds in their own favorite colors and patterns. This class is great fun for every level. It combines creative techniques in stenciling, texturizing and embellishment along with dimensional thread painting. A kit is available for this class that contains all the embellishment supplies used in this art piece. My advanced classes challenge students to choose their own subjects from photo's or any other non copy right materials and make a pattern. The basic construction is fusing and thread painting, but many other embellishment techniques are explored.